The insurance was requested by the transit agency’s advertising firm, On The Move Advertising, officials said. Because a handful of similar ads had been vandalized in other states, the ad agency required the payment for insurance reasons, said Jess Sweere, an attorney representing the transit authority. “To my knowledge, OTMA has not requested this in the past because no other advertiser told them their ads were vandalized in other markets,” Sweere told Reuters. Sweere said the transit authority was all set to accept the ads, but that the advertising firm raised the concerns that lead to the insurance requirement. Negotiations were still going on when the lawsuit was filed last week against the transit agency and the ad firm. “We were planning to run the ads as soon as the contract was worked out,” Sweere told Reuters. An attorney for the ad agency did not return calls seeking comment. Thomas said it’s clear his group is being punished for the actions of others. “The insurance money needed from us basically says CATA and On The Move trust the atheists in this community more so than the religious, otherwise the churches that advertise would have that extra insurance premium added to their total cost,” Thomas said. The coalition is asking a judge to issue a preliminary injunction forcing the bus company to accept the ads while the suit moves forward. The transit authority and its advertising agency were served with the lawsuit on Monday. They have 21 days to respond. The lawsuit was filed on behalf of the Arkansas group by UnitedCoR, a Washington-based national organization that focuses on organizing local atheist and agnostic groups into coalitions and funding their bus and billboard ad campaigns. UnitedCoR has placed such ads throughout the United States since 2008. Out of 36 markets where ad campaigns have run, four have been vandalized, including bus ads in Detroit last year, according to UnitedCoR’s website. Last year, UnitedCoR placed ads on outdoor billboards and buses in Fayetteville, Arkansas, without incident. In 2009, the Arkansas Society of Freethinkers, a group of atheists who are also involved in the bus ad campaign, successfully sued the state of Arkansas to erect a ‘Winter Solstice’ display on the grounds of the Arkansas State Capitol near a nativity scene. If this were a private bus company it would be a different story theoretically they can charge whatever they’d like. However, being that it is a public bus equal protection need be applied to all organizations be it atheist or religious as long as it does not violate the terms of what is and is not acceptable to be displayed on government property. Either they allow no ads of religious or irreligious persuasion or they charge them both fair price. Atheism is a religion whether they want to acknowledge it or not. Their belief is no God. Altho they are wrong there is still freedom of religion (last time I checked) in America. Everyone should pay the same amount. Anyone who’s faith in God is strong enough won’t be swayed by some advertisement about atheists. I believe that a contract should state that they will be held responsible for any damages caused by their advertisements. Everyone is entitled to their own opinions. This goes for any one who chooses to use this company. It is discimination. This is ridiculous! People look for reasons to argue and be upset. This makes clear financial sense for the transit company. One of our vehicles is a Ford Focus, we pay higher insurance on it, because it has a higher track record of insurance claims than our Dodge Nitro did when we traded it in. Now do we start saying this is penalizing us because of what others may do? No, that would be stupid. It seems to me it makes perfect sense. Our insurance company has done the research, they know what they can afford and what they cannot. I agree with Suzanne that they have the right to say whatever they want to say, does not matter if others disagree, but the public transit company also has the right to protect their property. The clause in a contract stating that they will cover any and all damages makes sense, but may be tricky and it would seem the insurance may come out cheaper. I just feel like marry to Jesus and you satan you leave alone. My husband is coming to take me to heaven. Jesus did not marry you you sick minded relgious zealote. 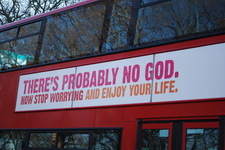 A sign on the bus causes and uproar, but it is perfectly fine for a complete stranger to knock on my door, get me out of bed on the weekend and tell me that my beliefs are not good enough, because I do not believe in Jesus or tell my son at catholic religious instruction that I am a sinner and will go to hell because I choose not to be a Christian. If organized religion was so wonderful, there would be no Atheists. People just need to agree to disagree. oops-continued…..should remain an individuals right to do so on his own property (s), or on rented/purchased advertisement space,unless vulgar and/or offensive sexually/graphicly deplayed in an agreed unappropriate manner to children of a young age that are easily influenced by graphicly pictured sexual acts. To cure yourself (the atheist) from unwanted religious visitors to your homes & businesses put up signs of your “disbeliefs” as we do of our “faith in GOD” and that will help prevent those “pesky-religious” persons of many different “faiths” away from your doorsteps. Any and all “CHRISTIANS” should always seek “GOD’S” answers in prayer rather than resulting to vandalism as alot of offended “non-believers” do. It is not the will of “GOD”. and claim they’re “violating their rights to free speech” when they are the 1s trying to tell other people can’t say this. so who’s rights are REALLY getting violated? how twisted & deep can vanity get? AMEN to Bill and David! It’s about time non-belivers get a say. I’m fed up with those Christian commercials on TV. Atheism has been classified as a religion by the courts. Therefore any posting of Atheist messages on government vehicles or buildings would therefore be a violation of the “Separation of church and state” clause. Take a moment and think before knee jerking. Im not religious. I am not an Atheist. I won’t be labeled. I do not beleive in God. I beleive in science and fact. Both say there are no magical powers that created our world. I would challenge any religious organisation to prove me wrong. I’m aware that science once thought our planet was flat. It was wrong before but we know too much now. We are educated. I can see that religion may give solace to some people but my opinion is that religion does more harm than good. It takes more lives than it saves. It’s not just Islam that is dangerous.. Chrisianityis just as dangerous. Your Pope actually said that condoms are making the AIDS crisis in Africa worse and they shouldn’t use them. Your pope is killing people. Think about that when you pray tonight. Actually, “atheism” means “to be without faith in a higher power”. So, it’s not a religion. It’s a movement. And yes, there’s an enormous difference. Err. No. Atheists like myself are not telling you to do/say A or B. We are however claiming that there is no God, just like you are claiming that there is one. We’re the only ones with proof, though. American courts, perhaps. Perhaps that’s because the judges are in fact, religious. The Atheist better fight now in this world because soon in the near future they will be totally defeated by Jesus and it ain’t gonna be pretty for them. I have seen the other side folks… it is there… get ready. Really Patrick and what is exactly your proof may I ask?